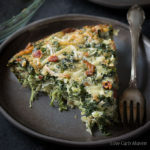 I’ve been making this low carb crustless quiche for several years now. It’s based on the original Dr. Atkin’s Spinach Quiche, except that I’ve changed the recipe per my tastes. And as far as quiches go, this is one of my favorites. This is a super easy quiche recipe because it is crustless. Omitting the pastry saves loads of time and carbs. And since the recipe uses frozen spinach instead of fresh, there’s no need to wilt the spinach before using – just thaw, squeeze and go! 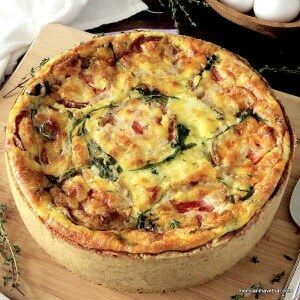 What I like about this low carb spinach bacon quiche it is that it’s not custardy. It’s substantial in texture and makes the perfect breakfast for Atkin’s Induction phase 1. 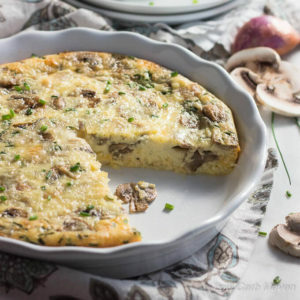 If you prefer that perfect custard quiche texture check out my crustless mushroom quiche or the delicious low carb ham arugula quiche. Looking at a day of 20 net carbs can be a little intimidating, but having a set carb count in the morning, can help you plan the day better. Don’t enjoy eating the same thing for breakfast everyday? That’s okay, change it up and have it for lunch instead of a salad. It’s a great tasting and filling meal. At 4 net carbs per serving, this quiche packs a healthy wallop of 20 grams of protein to help fuel your morning, and plenty of fat to satisfy even the most strict keto diets. I commonly divide my own quiche into 9 servings and one piece is still enough to keep me going until lunch. Eat this all week and you’ll be ready for a pancake treat come Sunday! Or for better portion control and better portability the Spinach Feta Quiche Muffins are AWESOME! 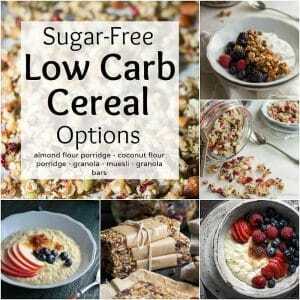 Try the Low Carb Pancakes. 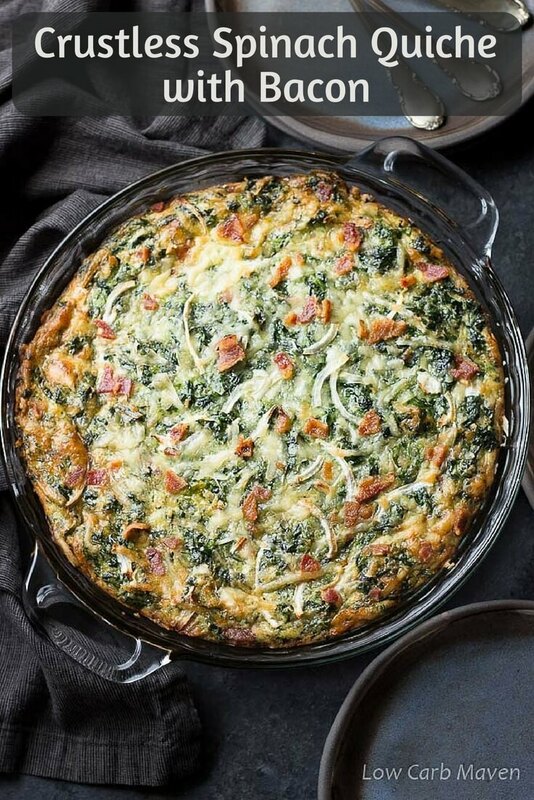 This Crustless Spinach Bacon Quiche Recipe is 4 net carbs per serving. 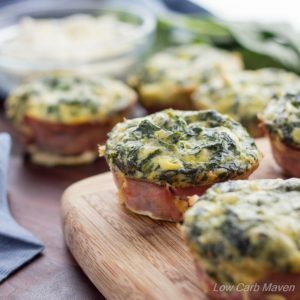 This easy low carb keto Crustless Spinach Bacon Quiche with bacon adapted from the original Atkins quiche recipe is great for those following the Atkins Induction phase (phase 1). Cook the bacon until crisp and chop. I do a whole pound in the oven and only use 1/3 for the recipe. Grease a pie plate or 8x8 glass dish. Preheat oven to 350 degrees F.
Thaw the spinach and squeeze dry. Slice the onion very thinly into half rounds or mince. Grate the cheese. Put all of the ingredients into a large bowl and mix with a hand mixer until totally combined. Pour into the prepared pan and spread with a rubber spatula. Place into the middle of the oven and cook for 40 minutes. Serves 6 at 4 net carbs per person. UPDATE: 2/28/18 - I changed my nutritional calculator from the MasterCook Cookbook program to Fatsecret[dot]com. I entered the ingredients into Fatsecret and changed the serving size from 8 servings to 6. I updated the nutritional information accordingly. Just to report back I made this and switched the bacon with Quorn ham and it was so yummy – I have been having it for lunch every day this week…thank you! Just making this and it’s in the oven now – can’t wait to see how it turns out thank you! Hi I don’t tolerate cream very well. Can I use almond milk? Thanks Kim. I made this yesterday. Used almond milk and a couple of tablespoons of sour cream. Also added grated zucchini as these are in season here in New Zealand at the moment and we have heaps in the garden. Turned out awesome, great flavour. Tried making it for the first time couple of days ago. The Quiche turned out great. Loved it! Thanks for a great share. This recipe was amazing. We didn’t have bacon so i used some breakfast sausage. Followed one of the tips to add some sour cream and it turned out great. Can’t wait to try it with bacon. My wife and I ate the whole dish by ourselves by accident for lunch. It’s so light yet fulfilling. Thanks!!! I changed just a few things for my taste. 10 oz of spinach, thick cut pepper bacon and mushrooms on half. It truly is THE BEST QUICHE I’ve had. One of my favorite recipes to sneak some veggies into my family’s food! This quiche is absolutely gorgeous! I love the bumped up nutrition from the added spinach. I need to give this one a try, perfect breakfast for dinner meal! Hi Kim! I just wanted to leave a comment about the spinach bacon quiche. This is one of the best quiches I’ve ever had! Easy to make. It’s the second time That whole making this. I am on the keto in this fits perfectly with my program. Thank you so much for this recipe and I can’t wait to try the others. The only thing I do different with this recipe is I add mushrooms. Just fabulous. I used this recipe but changed the ingredients for my keto “Meat Free Monday,” and I’m so in love with it! I admit I hate when people review something after they changed things around,but I’m going to because I want others to see it’s super easy and comes out great even if you aren’t vigilant. First, I only had a bunch of fresh spinach so I used that. I stir fried it real quick, then decided I also wanted to put mushrooms and, hey, why not even throw in my red pepper scraps. I browned those up too in a pan. Dumped all the stuff in a big bowl and realized I needed another egg and a splash of cream. I figured that would screw up the bake time so I just kept going until the middle was done, and …. Holy moly it’s delicious. I sampled a bite and then ate two more slices standing there in the kitchen. I’m going to make another one with whatever’s left over in the fridge and I’m totally okay eating this quiche and ONLY this quiche the next few days. GREAT recipe! Thanks so much! I hope this makes sense, and thank you! Can the quiche be frozen to be cooked at a later date? This is outstanding! So flavorful and yummy. I’ve made this multiple times and it’s always a huge hit with everyone! I usually make one for the week. It’s a healthy re-heat for breakfast, lunch and dinner! I like sending my kiddos off to school with a hearty breakfast and with veggies is a plus. My teenager is especially happy when I announce what’s in the oven! Thank you!!! Thank you so much for these awesome recipes. I have never (not ever) cooked until I started my LC/HF “diet” and your recipes are simple enough for a newb and super tasty. Do you have to grate the cheese, or does shredded cheese also work? I’m really looking forward to trying the recipe! Thank you for this wonderful recipe (as well as for the others, by the way). I’ve made this quiche a lot of times and it’s delicious and very filling. I particularly enjoy your recipes because you indicate quantities in metric measures as well. I am a European and for me struggling with conversion from the imperial system is often quite time consuming. This said, I’d like to point out that the metric weight of bacon in this recipe seems funny to me – 226 grams probably corresponds to 1/2 pound instead of 1/3. But it’s really no biggie, I’m only mentioning it for precision’s sake. Many thanks again for all your hard work! This was outstanding! I’m making another one in the morning….. I left out the cream and substituted soft tofu for the Swiss cheese, and cut the total calories in half (about 1000 total), AND the texture was still firm and the taste was hearty and savory. I also made the original recipe and it was DELICIOUS!!! did you use heavy whipping cream or half and half? I made the quiche this morning and it was out of this world fantastic!! I used fresh spinach instead of frozen and just ground it up in a food processor, but all else the same. Love, love, love!! In the blog body you say 30 grams of protein, in the nutrition info it says 20 grams. Can you advise which is correct? My husband said this is the best egg recipe I have made so far!! I did not use bacon (forgot to defrost it and was in a rush) but I will be making it again this week with bacon for sure. I swapped out the cheese in the recipe for feta just because it’s what I had in my fridge and I added mushrooms and sun dried tomatoes to get more veggies in. Soooooooo yummy, and it tastes good cold or hot so it’s perfect for meal prepping!!!! Perfect as is. Eating it tonight. Yum! Do you think I could make this the night before and put it in the oven in the morning? Made this for the first time yesterday; going to have to make another this weekend. The ingredients and weights were perfect! The only thing I changed was to use fresh spinach instead of frozen as I had a whole bunch to use. I steamed and squeezed the juice out before adding it to the rest of the ingredients. To be honest…I had a slice for tea last night, breakfast this morning and lunch today! Not feeling hungry for tea but I’m looking forward to breakfast tomorrow. Thank you so very much! Yum! Thank you for the recipe, it is perfect as written. Made it with a few changes, im not on a low carb diet but this sounded tasty. Used a mix of chorizo and bacon, added some mushrooms, used a mix of low fat cream and sour cream (had both in fridge) a whole onion, 2 cloves garlic and used low fat chedder cheese and Parmesan cheese. I added sour cream too and damn this was good!! I put the Chirizo on top mid way through cooking, next time I’ll mix it in. How many grams is one serving in this recipe? I know it serves 8, however I just wanted to see if there was a solid number. Thanks! I noticed that you said, “At 2 net carbs per serving, this quiche packs a healthy wallop of 30 grams of protein . . .”, but both my cronometer calculation and your own food label say 20 g per serving, but 30 g of fat. Was that an oversight? Hi Elizabeth. I’m just a little confused. I see that you mention net carbs, then protein then fat. I use a cookbook program called Mastercook to calculate the nutritional information and to store my recipes. I add each ingredient by weight for the most accurate counts. I also sometimes use Fatsecret.com making sure to enter the ingredients carefully in order to get the most accurate nutritional information. The serving size is 1 g? Please assist. LOL ~ it cannot be so! Hi. Sounds delicious! I’m on the hunt for low carb lunches that can be packed and eaten cold. Have you tried this cold? Crustless quiche = frittata.. Been a basic recipe for decades. Why not just label it as a frittata? Because a frittata still has a starch base, usually potatoes, and a different cooking technique, ie, in a skillet started on a stove and finished in an oven. This recipe is quiche without a crust, savory custard binding ingredients and cooked entirely in the oven. This recipe looks great. But since I am cooking for one, can I freeze the remainder for another meal? Can’t have Heavy cream or milk products . What can I use for the heavy cream? I’m going to feta for the cheese. I’ve made this quiche 3 times already and it was delicious every time. I only swapped the bacon for cooked ham (jambon cuit) because it’s more readily available here in France. The metric measurements are good/right, thank you for including them ! Hi. I can’t wait to make this! Do you think I can make it a day or two before serving? I want to make it for a girl’s beach weekend, and our “Fancy Brunch”, will be a day or two after we get there . Or can I prepare part of it and cook there? Thank you ? This quiche has been a staple for me since I started this way of eating. Once I left out the cream by accident and voila! it was still delicious and even lower in carbs! 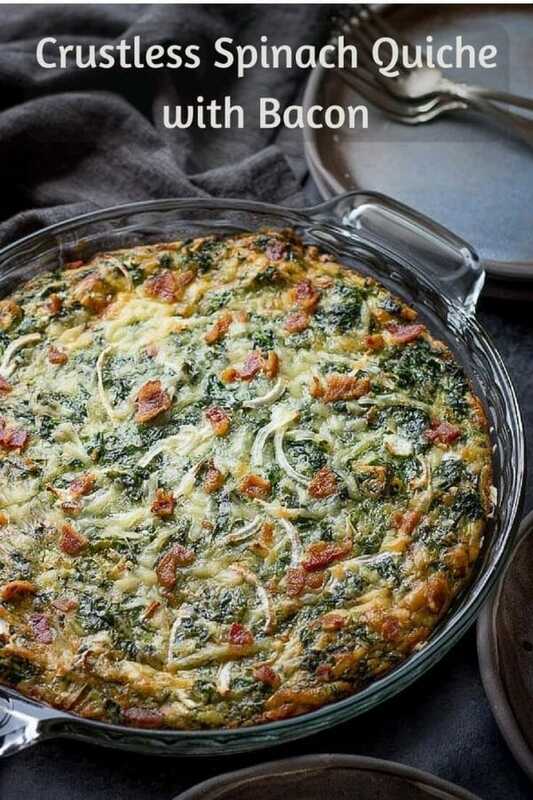 Your recipe for Spinach, Bacon, Onion Quiche has become a go-to favorite! Thanks for sharing your wonderful recipes and tips. Thanks so much for this recipe! I recently started the ketogenic diet, and my husband is finding it difficult to adjust to a low carb lifestyle. We tried this recipe for the first time tonight, and we absolutely loved it! The only thing we did differently was, we cut the spinach down to 12 ounces and added 4 ounces of mushrooms. It was wonderful! I made this quiche three days ago and me and my girlfriend have been eating it non stop! It is sooo good! Really good, especially with gruyere cheese. It was a great savory, grain-free contribution at a potluck. Made it the day before. Thanks for posting. This is hubbys favorite quiche! And an often requested recipe in general.. and super easy to make! 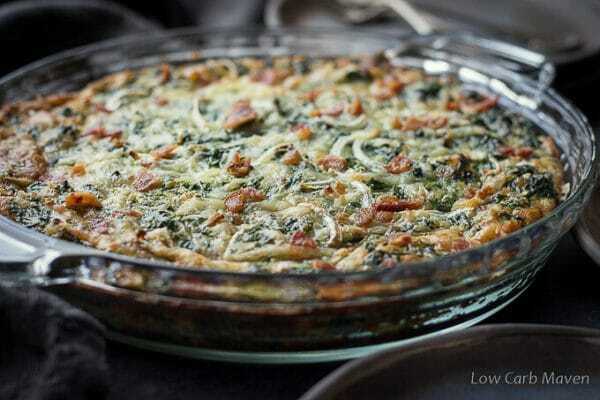 Just so you know, I follow this recipe exactly besides omitting the bacon and I use fresh spinach. I still use 16 oz and it’s perfect and very yummy! Very nice will try it. I like your recipes. Would like to receive them. Do you think this would work without the cheese for a dairy free version? I’m sure I could substitute coconut cream for the regular cream but not sure how it would go without the cheese. Maybe you could substitute goats cheese? This is a question. 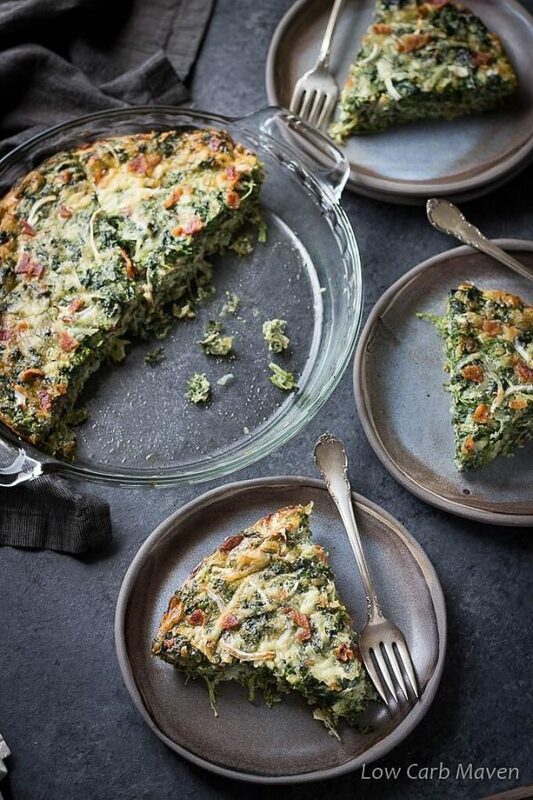 I can’t wait to make this….I love, love, love spinach. But I am such a spinach lover, I buy fresh spinach and take the stems off because I find them “stringy” and sometimes “coarse” or “chewy” when cooked. If I substitute fresh spinach (with stems removed), do you have any thoughts on how much I should use? I’m just not a fan of the quality I’m getting in frozen spinach and don’t mind the extra effort to use fresh….just not sure of a substitution rate. I guess trial and error would lead me to an amount over time. Thanks for any input!! If you are following a weight management program that calls for lower fat options, such as Weight Watchers, this is a great recipe with 3 easy modifications, replace the bacon with either Canadian or Turkey bacon, the cream with fat free cottage cheese and the shredded cheese with either 2% Milk fat Cheddar or use 1 ounce of grated Parmesan cheese. You would recommend cottage cheese versus milk or half and half for a substitution for the heavy cream? Does that change the texture much? Can chopped fresh spinach be used in lieu of frozen or does that change the flavor? I realize that increases prep time too. I’ve never made a quiche but hope to try this recipe. Thanks! Yes you can. I do it all the time. I don’t cook it. I just add chopped fresh spinach, but not as much as the recipe requires. What is the measurement for ounch and pound please. Made this tonight!! Love it!! !